Children's Parties - what’s included? We have a range of party packs for you to choose from : plate, mug or bowl at £14 and animal party or princess party at £17 per child. This includes the cost of the ceramic item and all materials, plus your choice of birthday cake and squash for the children. Our friendly staff will give personal instruction to help you and your guests have a fantastic time. A commemorative plate may be made for the birthday girl or boy for an additional £12. 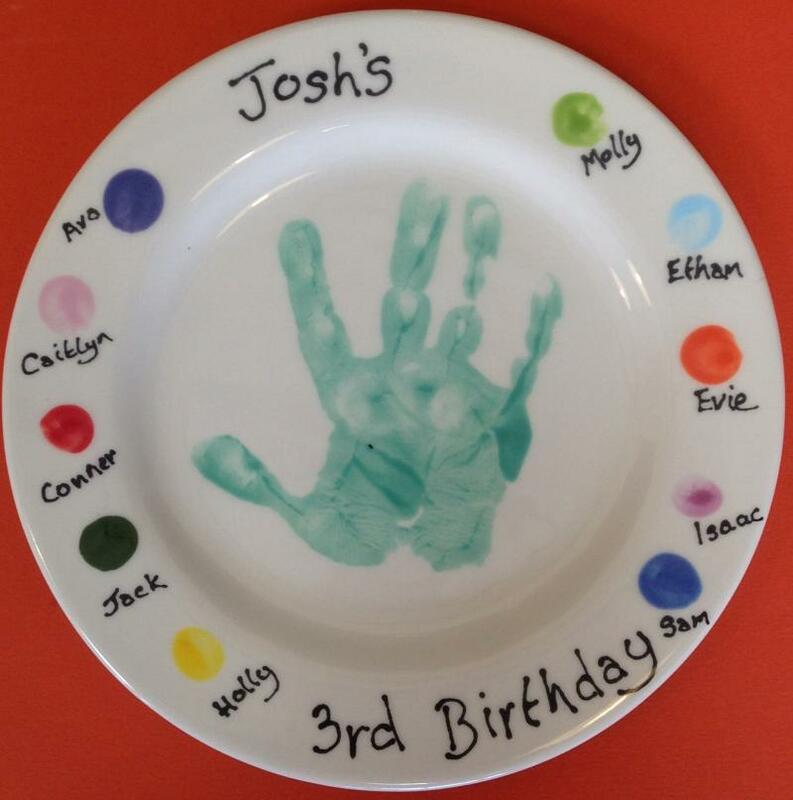 We would organise the party guests to place their finger prints and names around the rim, a handprint of the birthday girl or boy in the middle and finished with their name and which birthday they are celebrating. The prices are based on a minimum of eight children painting Monday to Saturday or ten children on a Sunday and we can accommodate up to 24. Parties run for 1½ hours, allowing approximately 1¼ hours for painting and 15 minutes for drink and cake. We may be running other parties in the day and space is limited, so please ensure your guests are collected promptly at the end of the allocated time. Can I have other party food as well? We offer a party menu at £3.95 per child. This includes a selection of sandwiches, crisps and popcorn. Cherry tomatoes, cucumber and grapes or banana may be included in addition at an extra cost of £1 per child. Children will paint for just over an hour before the tables are cleared and food served. Food must be ordered at the time of booking. Please do not bring your own food or snacks (accept for a dairy free alternative to birthday cake for any guests with dietary requirements). If you hold your party on a Sunday you will probably have exclusive use of the studio. Speak to us if you would like any different times - it may be possible. Just pop in to the studio to discuss your requirements and view the party packs on offer. We will take a £20 deposit to secure your booking, then relax and leave the rest to us! Final numbers need to be confirmed at least the day before the party. Ceramic paints (glazes) are washable and will not stain clothes, they will wash out without pre-soaking, although 'sensible' party wear is recommended as painting overalls are not provided.